Signed lr: "Wm. 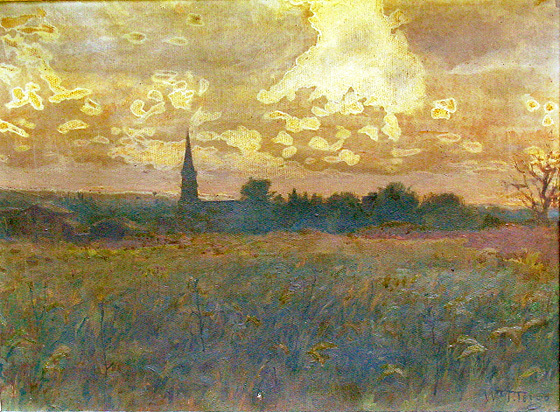 T. Trego"
The painting shows the old steeple of St. Peter's Evangelical Lutheran Church in North Wales as it looked at that time. The overall view, seemingly from the elevated area east of the church, may be a somewhat romanticized one, omitting several houses and other buildings that might have interfered with the view of the church. The home of Trego's friends, the Dowlin family, would have been just beyond the tree at the far right. A gift of the artist to Martha Dowlin of North Wales, it has been passed down though the family and is now in the possession of her great-grandchildren. The painting is in need of cleaning and perhaps some restoration. The sky area may have suffered damage, although it is possible it was never completely finished.